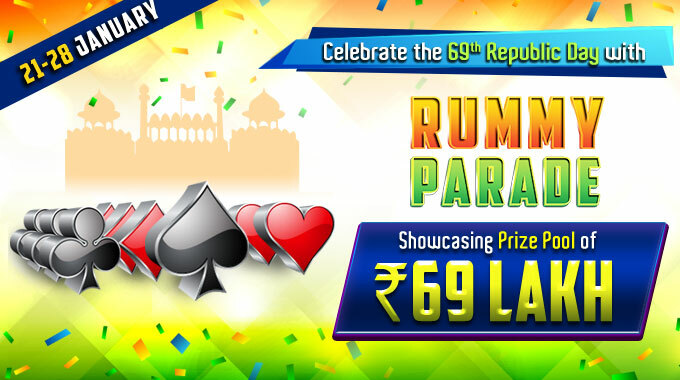 RummyCircle is celebrating the 69th Republic Day of India grandly by bringing the online cash rummy tournaments with Rs.69 lakhs prize pool. The tournaments will have multiple satellite and shooter rounds to get seated for the grand finale scheduled on 28th January 2018. The cash rummy players at the site can join the tables by paying an entry fee according to the rounds they are joining in. The entry fee can be as a low as Rs.70 for the Shooters. Get the entire details of the Republic Day special rummy tournaments at RummyMania.com and book your seat starting from 21st January. The cash rummy tournaments are named Rummy Parade, and the event will start with a Satellite at 8:30 PM on 21st January 2018. There will be two more Satellite rounds on the same day in intervals on one hour. The Satellites can be joined with an entry fee of Rs.750. The winners from these rounds will win their direct entry ticket to the grand finale scheduled on 28th January 2018. There will be more Satellite rounds on the consecutive days, that is, 22nd to 28th January 2018. You can increase your chances of winning the grand finale tickets by joining the Super Satellites. These rummy tournaments can be joined with an entry fee of Rs.7500, and each table will have six winners. The winners will get a ticket to the grand finale along with Rs.4500 in cash prizes. The Super Satellites will also run from 21st to 28th January 2018. The Shooters and Midnight Shooters tournament at Rummy Circle is the cheaper option to earn your way to the grand finale. Join the cash rummy tournaments with an entry fee of Rs.70 and win 4 PM Satellite tickets which are scheduled for the day. The Shooters and Midnight Shooters will start running from 12:00 AM between dates 22nd to 26th January 2018. The final round of the Rummy Parade will run on 7:00 PM with a maximum of 1401 players. Qualification to finale is by winning the entry tickets from the Satellite. So, get seated for these cash rummy tournaments now and play for a big prize pool of Rs.69 lakhs! We would love to your feedback on the gameplay, promotions and tournaments at RummyCircle.com. Subscribe to Rummy Mania and post your views in the comment section below.